Why lentils are good for you. Lentils are legumes, classified as a versatile nutrient rich super-food. They are protein rich and high in fiber. They are great source antioxidants, B-vitamins and iron. As far as iron content they rank in the top ten, even higher than spinach. Now for some lentil recipe history. Lentils are one of the oldest cultivated crops in the world and have been a part of our diet for over 12,000 years. Most of the US grown lentils come from Washington State and Idaho. One of the things that make lentils one of the best foods to consume is that unlike most other foods, the internal chemical structure is not changed by cooking, therefore able to keep the nutritional value. Download your free printable Lentil Recipe PDF. Why lentils are better than beans. One of the greatest advantages to cooking lentils over beans is that lentils don’t need to be soaked overnight. Not only that, they cook in about a third of the time. About 35 minutes. There are many types of Lentils. Green, brown, red and multi-colored types. The green and brown varieties have the highest nutritional value. The red and multi-colored type cook faster but they tend to get mushy easily. I suppose that’s fine if you plan to make a lentil paste for another type of meal. For this recipe I used green lentils. Lentils should be rinsed before cooking, unless the package you purchased says otherwise. I’ve often found some dirt, rocks and other debris in the package. Most cooking instructions call for 1 part lentils to approximately 3 parts water. For this recipe I’ll be making ½ cup of lentils with about 1-½ cups of vegetable broth. Using the broth with the mushrooms and rice is optional but gives this lentil recipe an excellent flavor. I've made this recipe a couple times without the broth but, it's not as tasty. By using 1-1/2 cups of water for this lentil recipe, there may be a bit of left over liquid in the bottom of the sauce pan when the lentils are done. That’s okay; it will make the mixture a bit soupier. But, just in case, check every now and then to make sure the water/broth hasn’t boiled out. It’s best to add salt right before serving if needed. I’ve noticed that by adding the salt to the lentils while boiling tends to make them tougher. As a matter of fact, it’s best not to add any additional ingredients to lentils while cooking, especially tomatoes. It slows down the cooking process tremendously! White rice tends to be better for any lentil recipes. Also, if by chance some foam collects on the side of the pot, take a spoon and scoop it out. When making lentils I try not too make too many so that there are lots of leftovers. Once lentils are cooked they do not last very long, even when refrigerated. I never keep them longer than a couple days. Chopped garlic, onion, parsley and mushrooms. A note for camping trips. Especially for lentil recipes like this one, I often have some rice already prepared before the camping trip. If not, I’ll take “rice in a bag” along to boil. It's much easier and it cooks really fast. Having only 2 burners on the camping stove isn’t enough some times! Lentil Recipe over Rice with Mushrooms. Note: 1 container makes 3-1/2 cups of broth. For this recipe I used a 1/2. Saving the left-over broth for another meal is another delicious possibility. The photo on the right shows Knorr Beef. Chicken and vegetable a also available. Preparation: Overall cooking time is about 30-40 minutes. 1 – Place the “rinsed” ½ cup of lentils with 1-½ cups of water and bring to a boil. 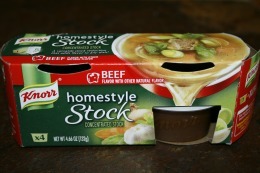 2 – Add the ½ tub of Knorr broth to the lentils and boiling water. Stir until the mixture is dissolved. Reduce to simmer and cover with a lid. When I last made this recipe they were done in about 35 minutes. Check every now and then that the water/broth hasn’t boiled out. 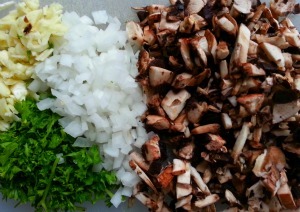 3 – Now is a good time to chop the onion, garlic, parsley and mushrooms. Keep the mushrooms separate. 4 – Place 1 tbsp butter in a frying pan and melt. 6 – Once the onions are soft and glossy, add the mushrooms. (Lower the heat so not to caramelize or brown the onions.) Stir with a spatula occasionally to mix until the mushrooms are soft. 7 – Reduce the heat to low and add the pre-cooked rice and stir, to heat the rice. 8 – By this time the lentils should be done. Taste the lentils; they should be soft but not mushy. 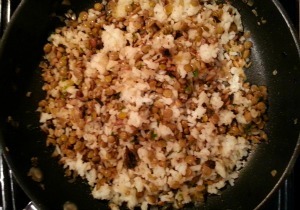 9 – When the lentils are done add them to the frying pan. Sprinkle the thyme over the contents and stir to mix in. Turn off the heat and let the pan sit for a couple minutes while you set the picnic table. 10 – Add salt and pepper to taste and then serve. A small green salad is an excellent addition to this meal. I made “baby bok-choy” salad covered with olive oil. Yum! Hope you enjoy the lentil recipe. Have fun with it. Take out and/or substitute any ingredient to make it tastier for you. Have you ever wondered...what is farro? Click here to go from the Lentil Recipe page back to the main Vegetarian page.